His name is Indigo… Named for the Indigo Bunting that was on the ground the first time he made his presence known by showing himself… In this photo, he was an adolescent boy… Today he is a remarkable young man… grown to adulthood and beginning his life’s work. Between the 4th and 5th change, he did something strange… more than just the wheat straw was changed on this day. 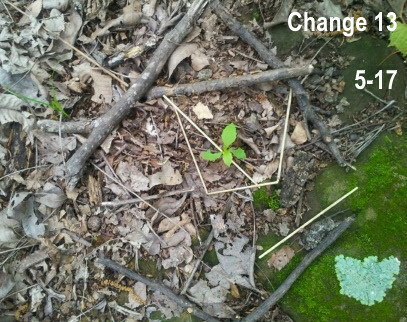 Change seven, again, is slight… it appears that both wheatstraws were moved again. Change nine is probably the slightest of the thirteen original changes. There are changes, but they are very slight and involve things other than the wheatstraws. 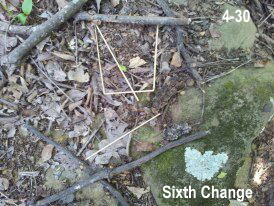 Four days elapsed between change nine and change ten, and then it was very slight. As is evident, change eleven is significant. Change twelve finds both wheatstraws moved and an entire week has passed since the last change.